Leinster moved level on points with Pro12 leaders Munster after beating derby rivals Connacht at the RDS. Shane Jennings scored an early try from a lineout maul to help Leinster into an 8-6 lead at the break. Two penalties from Jimmy Gopperth increased the advantage but Connacht hit back with George Naoupu driving over for an unconverted try. Zane Kirchner swopped on a loose ball and touched down with two minutes left to seal victory for the hosts. 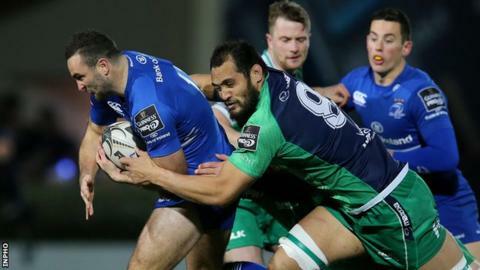 Leinster made the early running and the pressure increased on Connacht after lock Aly Muldowney saw yellow for taking out a support player at a lineout in their 22. Having turned down three kickable penalties, Leinster opened the scoring in the 12th minute as fit-again flanker Jennings piled over on the end of a maul. Gopperth missed the conversion but nailed a close-in penalty before Muldowney's return. Connacht fly-half Jack Carty failed with a first penalty attempt but he slotted between the posts on the half hour. Hands in the ruck saw Leinster prop Tadhg Furlong binned and Carty closed the gap to two points with the final kick of the first half. The defending league champions answered back on the restart with a long range Gopperth effort. A deliberate knock-on by Willie Faloon allowed Gopperth to open up a 14-6 scoreline. Connacht built momentum off Leinster penalties, with Devin Toner sin-binned for side-entry at a maul close to his line. From the resulting lineout and drive number eight Naoupu crashed over to give the visitors renewed hope. Carty missed a very difficult conversion into the wind and Kirchner had the final say with an opportunist try. Matt Healy attempted to keep Gopperth's touch-finding kick in play and Kirchner swooped on the loose ball to score, with Gopperth adding the extras. Leinster: R. Kearney, Kirchner, Fitzgerald, Reid, D. Kearney, Gopperth, Boss, Bent, A. Dundon, Furlong, Toner, Douglas, McLaughlin, Jennings, J. Heaslip. Replacements: Conan for McLaughlin (47). Not Used: Cronin, J. McGrath, M. Van Dyk, J. Murphy, L. McGrath, Marsh, D'Arcy. Connacht: Muliaina, Poolman, Henshaw, Aki, Healy, Carty, Marmion, Buckley, McCartney, Ah You, Roux, Muldowney, Muldoon, E. McKeon, Naoupu. Replacements: Loughney for Buckley (70), Dillane for Muldowney (70), Faloon for E. McKeon (48). Not Used: Heffernan, Bealham, Blade, Ronaldson, D. Leader.